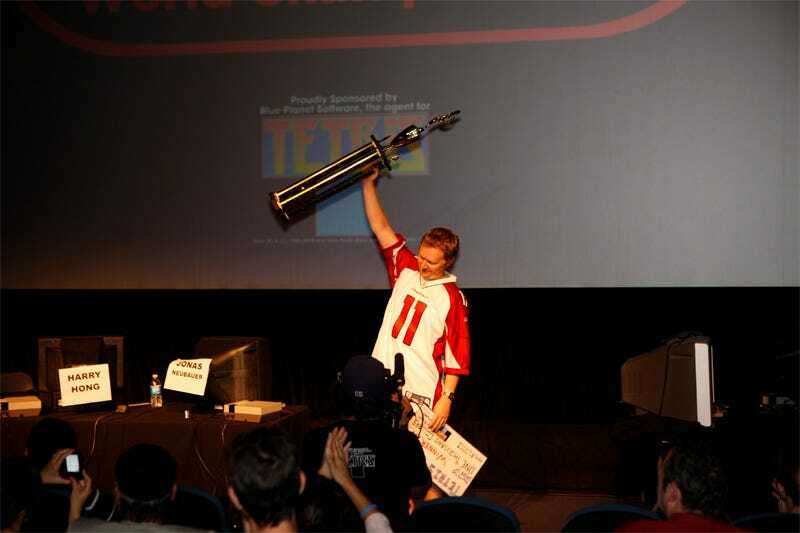 Yesterday at Los Angeles' Downtown Independent Theater, 29-year-old loan coordinator from Redondo Beach, California Jonas Neubauer was crowned the first-ever Classic Tetris World Champion. Over 200 players showed up to test their Tetris skills against the best the world had to offer at the Classic Tetris World Championship, organized by former Nintendo World Champion and Tetris expert Robin Mihara, sponsored by Tetris licensing management company Blue Planet Software. Tetris creator Alexey Pajitnov was on hand, keeping tabs on the action as those 200-plus players were whittled down to eight in the semi-finals. Neubauer defeated Harry Hong, a 25-year-old logistics specialist from Los Angeles, to bring home the giant trophy and $1,000 prize. Update: Forgot to mention that competitors were using the original NES version of the game.